Happy Holidays from One Man Left! In accordance with our American values, we’ve got stuff on sale! 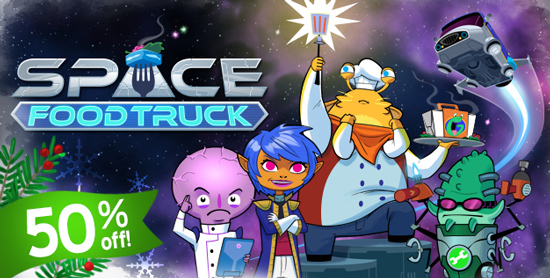 Our latest game, Space Food Truck, is a whopping half off its normal value pretty much anywhere you can find it, INCLUDING (for the first time ever) the tablet versions for Android and iOS! You’ll find savings for the desktop version via Steam and our official site. Then we thought, since we’re hard at work on the spiritual successor to Outwitters, why not include it in this year’s sale? 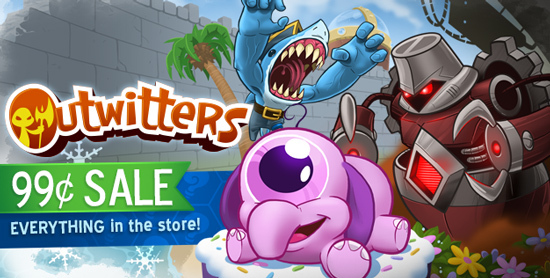 Download Outwitters for free on iOS and Android, and for a limited time everything in the store is just 99 cents! Enjoy these savings right through the New Year! Our prices go back to normal January 2nd.